Golden Seal, Hydrastis canadensis, is a premier tonic herb. A wide range of traditional uses of the root, primarily where an astringent action is required. Roots yield a yellow dye or black dye, depending which mordant is used. 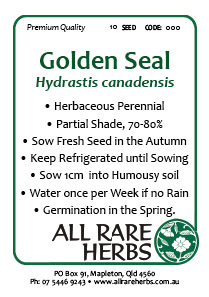 Golden Seal is native to Canada and the USA and prefers rich moist soils in a protected shaded position. Produces small white flowers in late spring or early summer. Frost resistant but drought tender. A rhizome based perennial plant, growing to 0.3m x 0.5m. Golden Seal plants are seasonally available. Be the first to review “Golden Seal, seed” Click here to cancel reply.